Download this program to find out what IP addresses are used and which ones are available. This program is also very useful for finding out what IP address your new Motorola mobile computer or Zebra barcode label printer has been given by the DHCP server if you have one. Open the link and download the free tool. After installing it run SolarWinds IP Address Tracker. Put in your base IP address, eg: 192.168.1.0 and it will list all the devices you on network and show the IP address assigned. You are looking for 'Symbol Technologies, Inc AP5131'. Shown here is one access point that has been found on our office network. Now that you have the IP address, open a web browser and key in the IP address. After a few seconds you should see the log in screen. Immediately you will be asked to change the password. Write it down and keep the password in a safe place. To watch online videos on how to configure the access point, setup encryption, MAC address filtering and mesh networking, click on this button. If you are having trouble viewing the login screen and the page remains white, go to google and search for 'java download' and go and install the latest Java software. 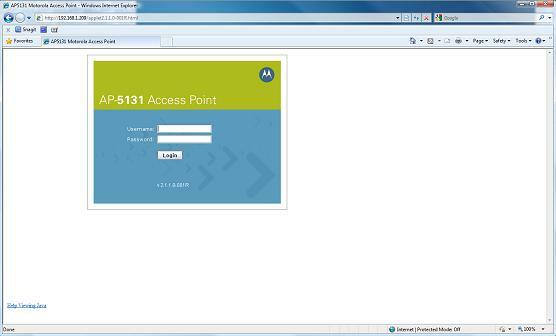 Then open a new web browser and put in the access point IP address and this time you should see the login screen. If IP Address Tracker cannot find the access point you are looking for then you can assume that you do not have a DHCP server running. Then open a web browser and key in the IP address to access the main menu.